The Rational solution for CLM comprises Rational Team Concert (RTC), Rational Quality Manager (RQM), and Rational Requirements Composer (RRC). Starting with RTC 3.0 and the underlying Jazz Team Server (JTS) 3.0 in November, 2010 and continuing with the release of the CLM products in June 2011, our licensing is getting a much-needed overhaul. Our focus has been on flexibility. This focus was the result of the user community’s feedback on how to improve licensing in our Jazz products. This document highlights some of the options that are now available to users of these Jazz products. We have eliminated a separately priced server: it is now included in the client licenses. 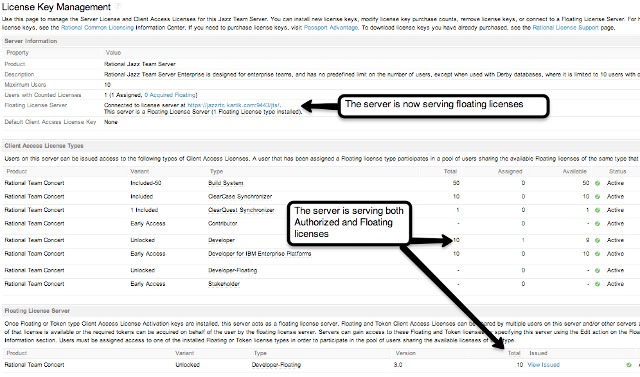 Also, we’ve separated the JTS from the CLM product capabilities, allowing for greater flexibility in deployment. 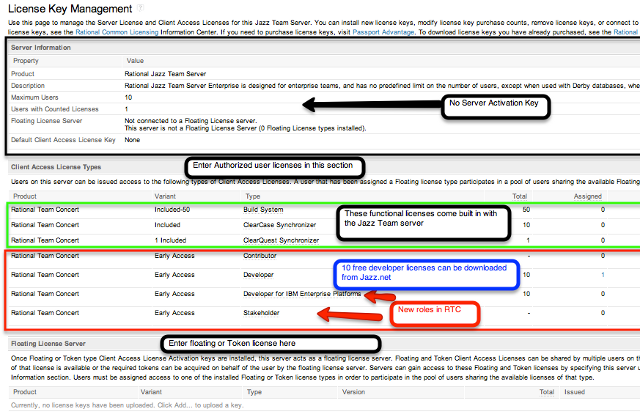 Additionally, licenses for all Jazz applications (products) sharing the same JTS can be managed centrally. This means when any of the CLM products are installed and configured to use the same Jazz Team Server, you can now administer all of the licenses from one administrative user interface. With the 2011 CLM product releases, our license types are more consistent. The primary RQM client license is now called “Quality Professional” and the RRC client license is now called “Analyst”. This results in the following lineup of primary license types: Analyst (RRC), Developer (RTC), and Quality Professional (RQM). We’ve also made the secondary license types more consistent. The RQM “Viewer” client license is now called “Contributor” and RRC “Reviewer” client license is now called “Contributor”. RTC Contributor remains as it was. So now all three CLM products have a secondary license type of “Contributor”. Further, and in recognition of the overlapping responsibilities of software professionals working across the lifecycle in these Contributor roles, the capabilities of the RTC, RQM, and RRC Contributor license types are the same. All have read/write access to work items, report customization, and planning and read access to source code, builds, and requirements and test artifacts. This means, for example, an RTC Contributor can view requirements and test execution records, an RQM Contributor can see source code changes and requirements, and an RRC Contributor can see iteration and test plans. 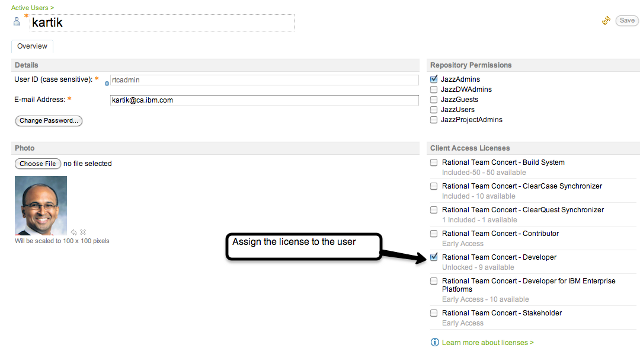 What are the client license types (roles) in CLM 2011? Prior to RTC 3.0, there were two basic types of client licenses, Developer and Contributor. In 3.0, we are introducing two more, Stakeholder, and Developer for IBM Enterprise Platforms (IEP). Before we get into these in detail, it’s important to note that in RTC 3.0 a user who does not have a license assigned still has read only access to view project work items, BIRT reports, and dashboards unless prohibited by the project administrator. The Contributor license is designed for professional team members actively participating in the project. A user that has been assigned a Contributor license has full read and write access to Change Management, Report Customization, and Planning. The Contributor license also provides read access to Software Configuration Management, Automation (Build System), Requirements Management, and Test Management capabilities unless otherwise restricted by role-based process permissions. The Contributor license capabilities are the same across the CLM products. The Developer license is designed for professional developers actively participating in the project. A user that has been assigned a Developer license has full read and write access to Change Management, Report Customization, Planning, Software Configuration Management, and Automation (Build System) capabilities unless otherwise restricted by role-based process permissions. The Developer for Workgroups license is similar to the Developer license except that it does not include support for distributed Software Configuration Management and is limited to 50 authorized users per server or server group. It is designed for departmental teams and budgets. Organizations can grow beyond 50 developers by adding Developer or Developer for IBM Enterprise Platform licenses, though the distributed SCM restriction will remain for all licenses on that server or server group. As mentioned above, the RQM license types change from the 2.x release to the CLM 2011 release. RQM Client is now RQM Quality Professional and RQM Viewer Client is now RQM Contributor. The Quality Professional license is designed for quality professionals actively participating in the project. A user that has been assigned a Quality Professional Client Access License has full read and write access to Change Management, Report Customization, Planning, Test management and Requirements management. This license also provides read access to Software Configuration Management and Automation (Build System) capabilities unless otherwise restricted by role-based process permissions. Again, as mentioned above, the RRC license types change from the 2.x release to the CLM 2011 release. RRC Author Client is now RRC Analyst and RRC Reviewer Client is now RRC Contributor. The Analyst license is designed for analysts actively participating in the project. A user that has been assigned an Analyst Client Access License has read and write access to Requirements Management, Change Management, Report Customization and Planning. This license also provides read access to Software Configuration Management, Test Management and Automation (Build System) capabilities unless otherwise restricted by role-based process permissions. You have several options for purchasing CLM (RTC, RQM, and RRC) licenses. In general, they are available as Authorized User Single Install, Floating User Single Install, and Token. Authorized User and Floating User Single Install are available both as perpetual licenses and term licenses. Token licenses are available only as term. Note, the explanations below include several illustrations using RTC. With the exception of the 10 free developers for RTC, the illustrations also apply to RQM and RRC. 10 Free for RTC Developers! Rational Team Concert (only) is free for up to ten developers, starting with RTC 3.0, with community support only. The license activation kits are available for download on the RTC download pages for the respective releases, 3.0 and CLM 2011 (3.0.1). These are Authorized User Single Install only. An Authorized User Single Install (AUSI) license is a license that is associated with a particular user ID on an instance of a JTS. A user is required to have an associated AUSI on each JTS he or she needs to access. 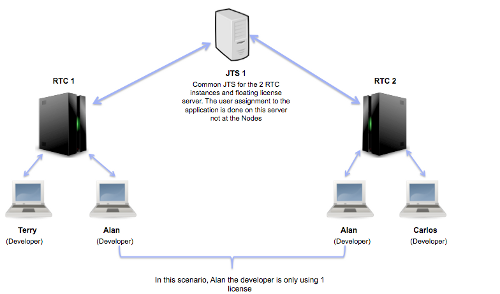 For example, imagine that an organization has two RTC servers, each with its own JTS server (as shown in Figure 2). Terry and Carlos each require one Developer AUSI license. Because Alan is accessing JTS1 and JTS2 (through RTC1 and RTC2), Alan requires two Developer AUSI licenses, one installed on each of JTS1 and JTS2. 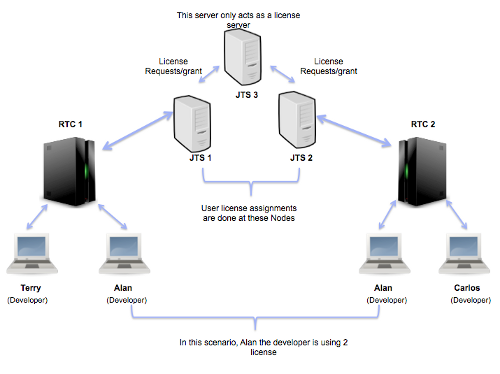 If RC1 and RTC2 were to share a common JTS, then Alan would require one Developer AUSI license to access both the RTC instances (As shown in Figure 3). Because the license control is managed at the Jazz Team Server, Terry, Carlos, or Alan can simultaneously access a JTS instance from multiple different computers and require only one license for access on that JTS instance. In order to use an AUSI license on a particular server, the respective activation kit needs to be installed on the Jazz Team Server. 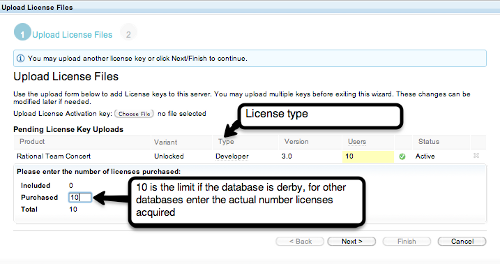 Once the activation kit is installed, the number of licenses purchased is entered by the administrator. This process is similar how it has been in earlier releases of the CLM products. Authorized user license activation kits are available at the Rational License Key Center (https://licensing.subscribenet.com/control/ibmr/login) when you purchase your CLM product. A Floating User Single Install (FUSI) license is one that is dynamically allocated to a user from a pool of licenses, if a license is available. If not, no license is granted. FUSI licenses are administered by a Jazz Team Server operating as a floating license server. This can be a JTS that is part of a CLM installation or it can be a JTS running stand alone, e.g. and serving FUSI licenses to multiple CLM (RTC, RQM, and RRC) instances. One significant enhancement starting with RTC 3.0 and continuing with the CLM 2011 release is the ability for a user to explicitly release a FUSI license by logging out and have the license return to the pool of licenses. If a user is logged onto RTC, e.g. from both the RTC web client and the Eclipse client, the user would have to log out from both clients for the license to be returned to the license pool. 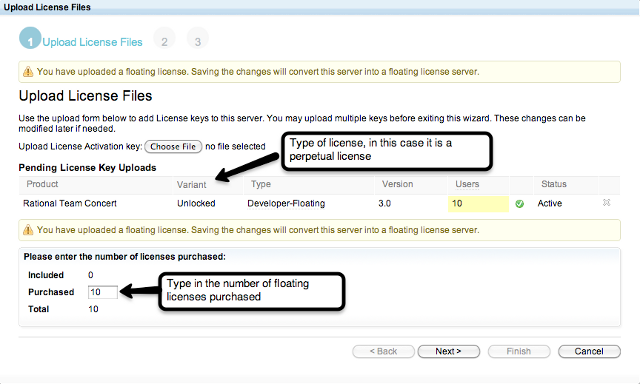 In Figure 7, JTS1 is also operating as a floating license server. 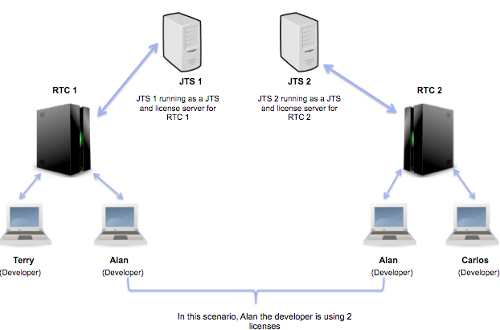 In Figure 8 the assumption is made that the JTS is running as a license server as well. 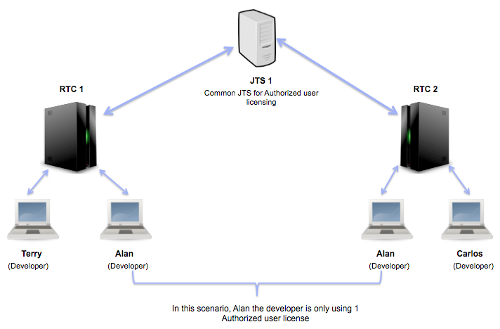 It is also possible to have a JTS instance operate as a floating license server that is separate from the actual JTS server, as shown in Figure 9. In Figure 9, Alan, Carlos, and Terry are each using one FUSI. In Figure 10, Carlos and Terry are each using one FUSI and Alan is using two (one for each of the JTS instances he’s accessing) In Figure 9, Alan is still using 2 licenses. Like with AUSI licenses, in order to use a FUSI license on a particular server, the respective activation kit needs to be installed on the Jazz Team Server. Once the activation kit is installed, the number of user licenses purchased is entered by the administrator. In addition, to use FUSI licenses, the JTS on which the FUSI licenses are installed has to be configured as a floating license server. Given that FUSI licenses are allocated from a pool based on user needs, the question arises, given a population of users, how many FUSI licenses are required. The following are rough approximations and are very dependent on the intensity of work by your users. RTC Contributor. The typical ratio is 3:1, or three users to one FUSI. Contributor license holders are normally slightly more intensive users because they have more privileges than the Stakeholder license holders. RQM Contributor. The typical ratio is 3:1, or three users to one FUSI. Contributor license holders are normally slightly more intensive users because they have more privileges than the Stakeholder license holders. RRC Contributor. The typical ratio is 3:1, or three users to one FUSI. Contributor license holders are normally slightly more intensive users because they have more privileges than the Stakeholder license holders. Token licensing is a new type of licensing that was introduced with RTC 3.0, RQM 2.0.1.1, and RRC 2.0.0.3 and continues with the CLM 2011 release. A token license is a special form of fixed term and floating license managed by a JTS operating as a floating (token) server. Each product license type consumes a certain number of tokens based on the price of that license. A customer purchases a quantity of tokens to be used across a designated set of entitled products. Customers may use any mix of entitled products until their aggregate quantity of tokens currently in use are exhausted. If someone stops using a product license, those tokens are returned to the token pool and are available for someone else to utilize. Token licenses are more flexible than FUSI licenses in that the former can “float” across a set of different products. For more details about token licensing, read the technote on Token licensing for Jazz based products, and contact your local IBM marketing representative. Authorized User Single Install (AUSI) and Floating User Single Install (FUSI) licenses can be purchased as perpetual licenses or fixed term licenses. Note, this refers only to the license to use the software, it does not apply to subscription and support. Perpetual licenses do not expire, whereas fixed term licenses expire within a specified amount of time, based on the type of licenses an organization has purchased. Both type of licenses are be acquired from the Rational License Key Center (https://licensing.subscribenet.com/control/ibmr/login). At the Rational License Key Center term licenses are handled differently from perpetual licenses. Term license keys are customer specific and are generated based on customer order information. We’ve delivered a number of important enhancements to our licensing support starting with RTC 3.0 and continuing with our 2011 CLM release, enhancements that make our Jazz products easier for users to access and easier for administrators to manage. Like everything else that we do, we look forward to hearing feedback from you on these improvements. Have a go and let us know what you think. Was this information helpful? Yes No 34 people rated this as helpful.